The Cape May Lighthouse is a lighthouse located in the U.S. state of New Jersey at the tip of Cape May, in Lower Township's Cape May Point State Park. It was built in 1859 under the supervision of U.S. Army engineer William F. Raynolds, was automated in 1946, and continues operation to this day. It is the third fully documented lighthouse to be built at Cape May Point. The first was built in 1823; the second in 1847. The exact locations of the first two lighthouses are now underwater due to erosion. There are 199 steps to the top of the Lighthouse. 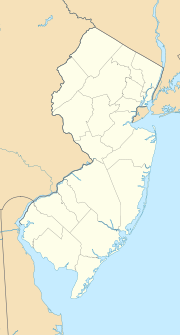 The view from the top extends to Cape May City and Wildwood to the north, Cape May Point to the south, and, on a clear day, Cape Henlopen, Delaware, to the west. Within immediate view are Cape May Cove and Battery 223, a harbor defense battery originally built during World War II. Cape May Lighthouse was added to the National Register of Historic Places on November 12, 1973. The lighthouse is owned by the state of New Jersey after ownership was transferred from the Coast Guard in 1992, which maintains it as an active aid to maritime navigation. The State of New Jersey leases the structure and grounds to the Mid-Atlantic Center for the Arts & Humanities (MAC). MAC raises funds for the restoration and upkeep of the structure and opens the lighthouse to the public for climbs to the top. MAC has installed interpretive exhibits about the lighthouse's history, the lives of the former lighthouse keepers, and other maritime history of the Jersey Cape for visitors who climb. In 2013, MAC celebrated the 25th anniversary of the opening of the lighthouse to the public for climbs. From its opening in May 1988, over 2.1 million people have paid to climb to the top. Every October, the Cape May Lighthouse is a participant in the New Jersey Lighthouse Challenge, a statewide event. The tower is 157 feet 6 inches (48.01 m) tall, from the ground to the tower's cast iron spiral staircase. There are 217 steps from the ground to the top, with 199 steps in the tower's cast iron spiral staircase. The lighthouse has two separate walls. The outside wall is cone-shaped, and is 3 feet 10 inches (1.17 m) thick at the bottom, and 1 foot 6 inches (0.46 m) thick at the top. The inside wall is a cylinder with 8.5-inch-thick (220 mm) walls which support the spiral staircase. The walls were designed to withstand winds several times above hurricane force. ^ a b c d e f g h i "Inventory of Historic Light Stations -- New Jersey". Maritime Heritage Program. National Park Service. 2004-11-05. Retrieved 2009-04-09. ^ "History of the Cape May Lighthouse". Mid-Atlantic Center for the Arts & Humanities. Retrieved June 29, 2018. ^ National Park Service (November 2, 2013). "National Register Information System". National Register of Historic Places. National Park Service. ^ "New Jersey and National Registers of Historic Places - Cape May County" (PDF). NJ DEP - Historic Preservation Office. March 1, 2011. p. 3. Archived from the original (PDF) on June 28, 2011. Retrieved April 26, 2011. ^ "About MAC". Mid-Atlantic Center for the Arts & Humanities. Retrieved August 17, 2015. ^ "Structure of the Cape May Lighthouse". Mid-Atlantic Center for the Arts & Humanities. Retrieved November 22, 2017. Wikimedia Commons has media related to Cape May Lighthouse. Some areas considered to be Rio Grande are in Lower Township. This page was last edited on 11 March 2019, at 19:09 (UTC).